Everyone who begins to grasp what GMOs are starts asking, “Hang on – do I really want to eat these?” “Do I want my kids to eat these?” “Do I want my neighbour to eat these?” Then you say, “Well…. maybe there are people out there who think they are fine (just maybe)…. Like those people who choose to smoke, for example. I mean, how telling is it that in at least one Monsanto cafeteria, the food service company removed GMOs from the menu? But how do you know if the food you eat has them or not? If they are not labelled, how on Earth can we know besides doing a genetic test or pesticide residue test whether they contain GMOs. 1) GMOs are in 80% or more of all supermarket food. 2) 64 countries including China and Russia require labelling. Tomorrow do the same. Try to tell 14 new people about it by the same time next week. You might be telling them the most important thing of their lives… The right to know what’s in our food is going to define this generation. I am seeing it daily. 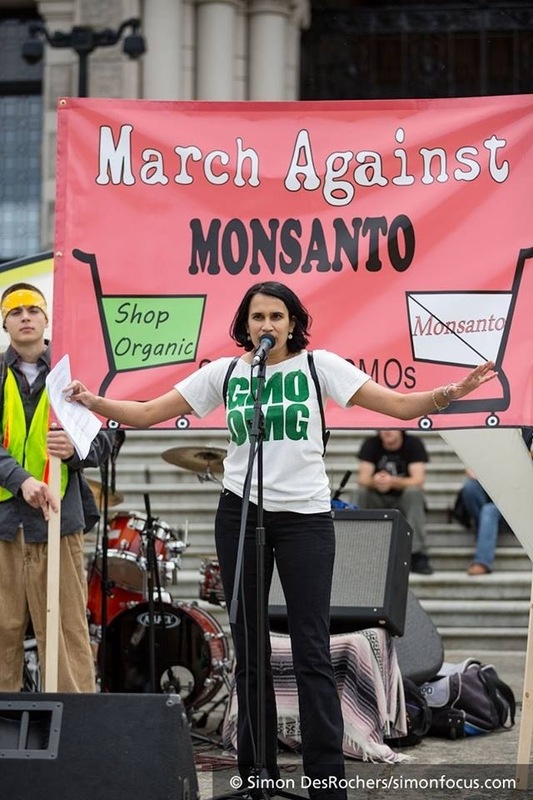 This entry was posted in Mobilize and March, Music, Right to Know, The Environment and tagged 2013, GMO rap song, GMOs, March 25, March Against Monsanto, Misty, Misty's NO GMO Rap, Simon DesRochers, simonfocus.com, spread the word on May 27, 2013 by Gurdeep Stephens. Thanks for sharing it on your blog, we have a voice, rap used to be a method to bring change, I hope it comes back to that state of positivity.